In the early 21st century, things are beginning to change in Antarctica. Scientists still come down to the American base at McMurdo to do research, but they now bump shoulders with tourists hoping to retrace the treks of early explorers. More seriously, with the world's oil fields almost depleted, multinational corporations are jockeying for position, conducting secret explorations for oil and spending millions to defeat the renewal of the Antarctic Treaty, which has reserved the continent for purely scientific research for half a century. And other, even more secretive groups apparently haunt the Antarctic outback as well: feral human societies and radical environmentalists whose motives are only partly understood. Antarctica is undergoing major climactic change, too, perhaps the most dramatic example of the global warming that has turned much of the world's former temperate zone into a steam bath. The Ross Ice Shelf has largely broken up and the enormously greater Antarctic icesheet may be about to follow suit. Robinson (Blue Mars) brings to this novel a passionate concern for landscape, ecology and the effects of the ""Gotterdammerung capitalism"" that he sees as the most serious threat to the survival of our species. His major characters--a U.S. senator's aide, a professional Antarctic mountaineer and a misfit doing grunt labor at McMurdo--are well drawn, but ultimately the novel is about the land itself. 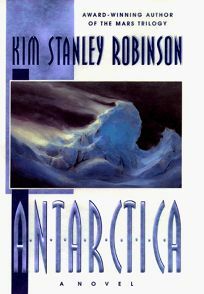 Moving back and forth between breathtaking descriptions of the alien, out-of-scale beauty of Antarctica, gripping tales of adventure on the ice and astute analyses of the ecopolitics of the southernmost continent, Robinson has created another superb addition to what is rapidly becoming one of the most impressive bodies of work in SF. (July) FYI: Each of Robinson's last three novels, Red Mars, Green Mars and Blue Mars, won either a Hugo or a Nebula.